Endangered Species Games is an interesting category appeared on our site where you will get a lot of exciting games for girls and boys, for all the kids who want new challenges, who want to meet new cute characters from cartoons. This series is from Teletoon and I am sure you will love it because it has interesting characters, three animals. The animals are Pickle the bunny, Gull the seagull and Merl the squirrel. They are best friends and they have all kind of adventures together. They always get in trouble, most of the times because of Pickle who does all kind of crazy things without thinking about the consequences. You are going to get a lot of interesting games here on our site in Endangered Species Games category so try them all to find your favorite one. Your skills will be tested here and you have to do your best to prove that you deserve a place on the podium where are only the best of the best. In the Endangered Species Games category you are going to find a puzzle game, a memory game and some exciting games where your skills will be tested at maximum. You are going to start flying with Gull in a game and your goal is to go as far as possible. This game looks like flappy bird and it is exciting. You will fly in the city and you have to avoid all the obstacles in your way if you want to survive against the nature. In the game the score is important, it can take you in the top of the best players in the world. To successfully reach the top you have to fly as far as possible with the bird. It is not simple at all, you have to work a lot to complete your goal. In that memory game you have to use the mouse to turn two cards at a time to check if they are similar. You need the mouse also in that flying game to control the bird. If you hit something the game is over. You can reach the top also in the memory game from Endangered Species Games category if you find quickly all the pairs. 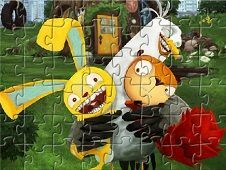 In this exciting game you have the chance to see a lot of images with your heroes from cartoons. Pickle is the leader of the group and he is very energetic all the time, ready for a new adventures, as dangerous as possible. His friends follow him everywhere and they have a lot of fun together. I am sure you want to have some fun so play these games with Endangered Species and I am sure you will enjoy them. Leave us a comment to tell us which was you favorite game and if you have suggestions for new categories. A g plus will be helpful because we can promote more this category for all the fans. 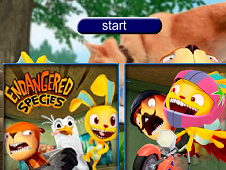 There is an exciting racing game in Endangered Species Games category where you can drive some karts with Pickle and his friends. Merl is a squirrel and is very smart. He thinks all the time before doing something and he always saves Pickle who gets in trouble. Gull is very naive and he would follow Pickle everywhere without thinks at the dangerous things that can happen. If you successfully reach the podium I am sure you will be proud of your self. Also Pickle, Merl and Gull will be impressed but if you want to keep your place you have to overtake your own record because anytime a better player can appear and defeat you. In these games you are going to interact with your heroes from cartoons and I am sure you will have a great time. 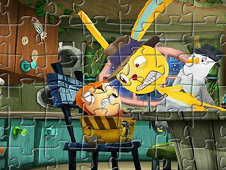 If you do not know the animated television series I am sure you will be impatient to watch it after you try these games. Our site is going to bring you all the time new interesting categories like this one. I think you will be glad to know that on our site you can find at least ten new games every day and new categories every week. Do your best to complete your goal in each game if you want to prove that you are skillful. YOU KNOW THIS ABOUT Endangered Species Games? 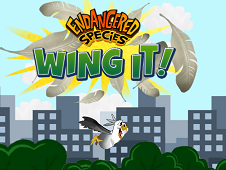 In Endangered Species Games page you can find 3 games that we've published for these kids and children that are interested to play Endangered Species Games, this game category have been created on 19.08.2017. These games with Endangered Species Games have been voted a lot of times and we are inviting you to let a comment after each of this game.